As humans evolved, wisdom teeth became no longer necessary and actually creates problems for most people who have them. Wisdom teeth, by many scientists, are considered vestigial organs, or parts of the body that are no longer needed due to evolutionary advancements in the human race. Why get your wisdom teeth pulled as an adult? After all, your wisdom teeth don’t bother you that much and you’ve had the molars this long. So why disturb your mouth by removing them? Here are reasons why you should get your wisdom teeth pulled as an adult. Many patients who opt to have their wisdom teeth removed later in life have already suffered from crowed teeth. Protect the health of your teeth by having your wisdom teeth examined by your dentist to see if your third molars require removal. Most of the time you don’t even notice your wisdom teeth, but if they are still in your mouth as an adult, you may experience a sharp stabbing pain in the back of your mouth, swelling in your gums, or discomfort due to soft gum tissue as your wisdom teeth shift around. Wisdom teeth will erupt in your mouth any way they can, which is often sideways or at a very harsh angle. Wisdom teeth often erupt slightly then slide back under the gum line, only to reappear days or weeks later to wreak havoc on your mouth again. Painful wisdom teeth are not only annoying, they are also very serious: you can get an infection in your mouth that can lead to an abscessed tooth or gum disease. The ideal way to get rid of the pain is to remove the wisdom teeth completely. The longer your wisdom teeth stay in your mouth, the more rooted to your jaw bone these molars become. When you were in your teens and your wisdom teeth had smaller, less secure roots, the teeth were easier to remove. Now as an adult, that same molar removal is more serious and time-consuming. 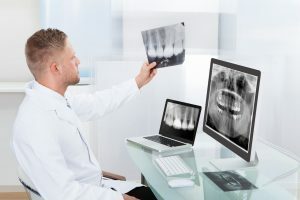 Your dentist will x-ray your mouth to see how embedded in your jaw bone your wisdom teeth are to prevent as much jaw bone loss as possible during extraction. They can also ensure your third molars’ roots aren’t entangled in the roots of other teeth. The longer you wait to have your wisdom teeth taken out, the more complicated and extensive the removal process will be. Few people go throughout life without wisdom teeth bothering them at all. It’s likely time to get your wisdom teeth removed to stop or prevent pain. Speak to your dentist about your own wisdom teeth to see if removal is the best option for your oral health. Our team of specialists at Family First Dentistry LLC will make your dental experience as comfortable as possible.